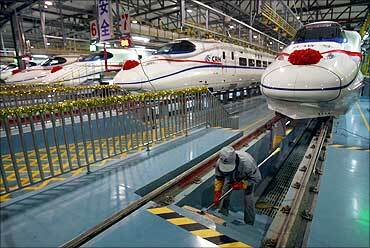 Rediff.com » Business » Delhi-Agra, Lucknow-Patna bullet trains soon? 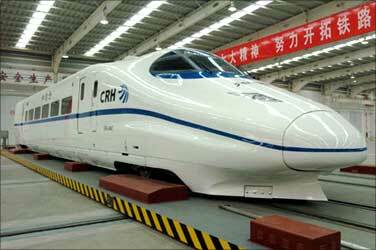 Delhi-Agra, Lucknow-Patna bullet trains soon? Railways have invited consultants for conducting a pre-feasibility study on running high-speed trains between Delhi and Agra and between Lucknow and Patna via Varanasi. The study would seek to assess the feasibility of constructing high speed corridors on these routes, the route alignments and the ridership study among others, sources said. At present, the ministry is studying the feasibility report about development of a high-speed corridor between Pune and Ahmedabad via Mumbai. 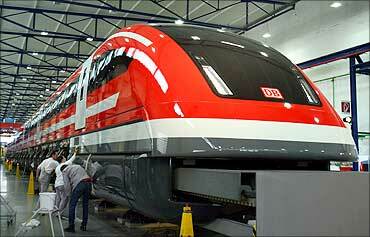 Image: Workers polish a prototype of the new maglev Transrapid high-speed train in the central German city of Kassel. Railways have already envisaged six such corridors across the country which could be taken up through the public-private-partnership mode given the exponential cost involved in the projects. The Delhi-Chandigarh-Amritsar corridor is one of them. According to the sources, laying just one km of high speed corridor could cost about Rs 80 to Rs 100 crore (Rs 800 million to 1 billion) as compared to Rs 5 crore (Rs 50 million) for laying a conventional track. Being cost intensive, the projects would also have to take into account the energy requirement for running the high speed trains, the state-of-art signalling system and other technical aspects. Image: A labourer cleans the stairs beside a China Railway High-speed train. Erection of sound barriers would also have to be looked into, the sources said, adding, another issue is passenger fare which is being studied in detail. The other proposed high speed corridors include the Chennai-Hyderabad, Chennai-Bangalore-Coimbatore-Ernakulum and Howrah-Haldia. Indications are that the high-speed rail corridors could be built as elevated corridors in keeping with the pattern of habitation and the constraint of land.